i’m starting to really dig those social web-apps. one the last discoveries of mine is upcoming.org . upcoming. org is a social event calendar driven by people like you and me. people can manage their events there and i have a neat way of showing some of my upcoming stuff i’m planning to attend or just got in my date book. which leads me to the title of this post: “… in the sidebar” . 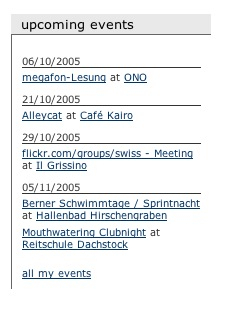 since the events can be shown to any site with the upcoming.org badge, i’ve added my next 5 events to the sidebar. with some css-tinkering it also looks like it belongs in the sidebar. so if you want to see what i plan to to in the next few weeks, then you can now peek there (but i’m not gonna tell you stuff that i plan to visit the einstein exhibit with nina this weekend, so no stalking me…). which got bought by yahoo yesterday, which made every news-site post about that, which made me tinker around with it a bit more. so it’s actually a re-discovery, i can’t remember when i first encountered it. what i know is, that i encountered it much later than b. (just look at my or his user number…).